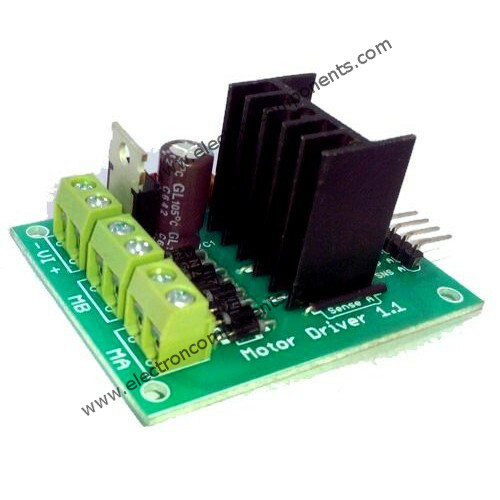 This L298 46V, 2A Stepper Motor / Dual DC Motor Driver module can drive bipolar stepper motor or Two DC motors at the same time. Each L298 has two H-Bridges. Each H-Bridge can supply 2Amp. current. L298 has heat sink for better heat dissipation and flyback diodes for protection from back EMF. For higher current rating these H-Bridges can be connected in parallel. Board has terminal block for high power connections and open pads for logic interfacing. Board is made of double sided PTH PCB for giving better strength to the connectors. For easier mounting board have four mounting holes. Can drive one bipolar stepper motor or two DC motors.